Having three daughters, we have acquired plenty of experience in dying Easter eggs over the years! Some attempts were more successful (and messier) than others. Here are a few of our favourite ideas for you to try with your own kids…or, all by yourself! 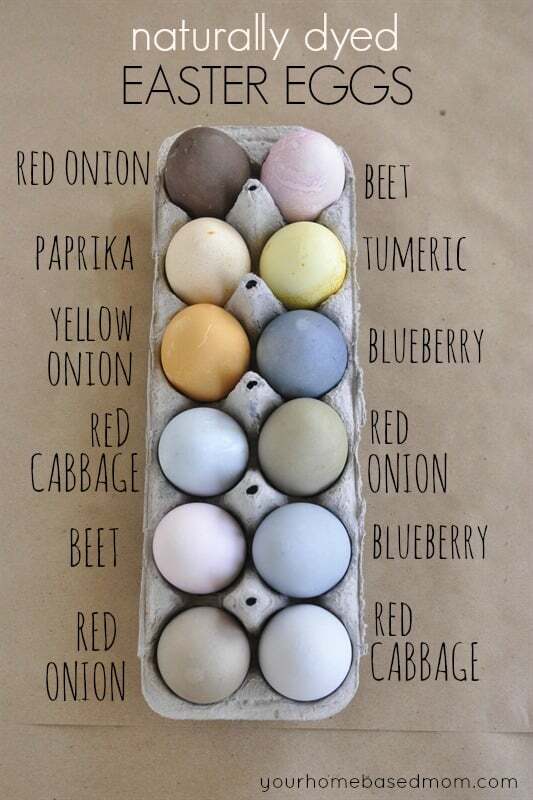 Vegetable Dyes – My Dad, who grew up on a farm in Alberta, always tells our kids that this is how he used to dye eggs. Some options we’ve tried that got decent results were purple cabbage, red or yellow onion skins, beets, blueberries, turmeric and paprika. Place approx 2 cups of chopped veggies or 2 tablespoons of spices in 2 cups of water and boil for 10-15 minutes. Remove the veggies from the water, add 1-2 tablespoons of white vinegar to each colour and let cool. Dye your eggs as you normally would. These dyes can be difficult to remove from fabric and even some counter tops, so a cheap plastic tablecloth from the dollar store or an old shower curtain will definitely come in handy! 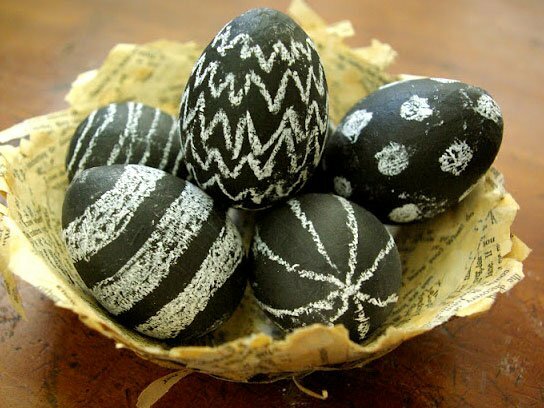 Chalkboard Eggs – Write messages on eggshells with this great idea from Oleander and Palm: Coat eggs with a layer of chalkboard paint (available at any craft store) and let your chalk do the talking. Want to change a design? Simply wash the egg’s surface and draw again. Sprinkles – Blogger Studio DIY! suggests using sprinkles for a festive look that isn’t too hard to pull off. All you will need is nonpareil sprinkles (preferably fun Easter colors), tacky glue, and a paintbrush. 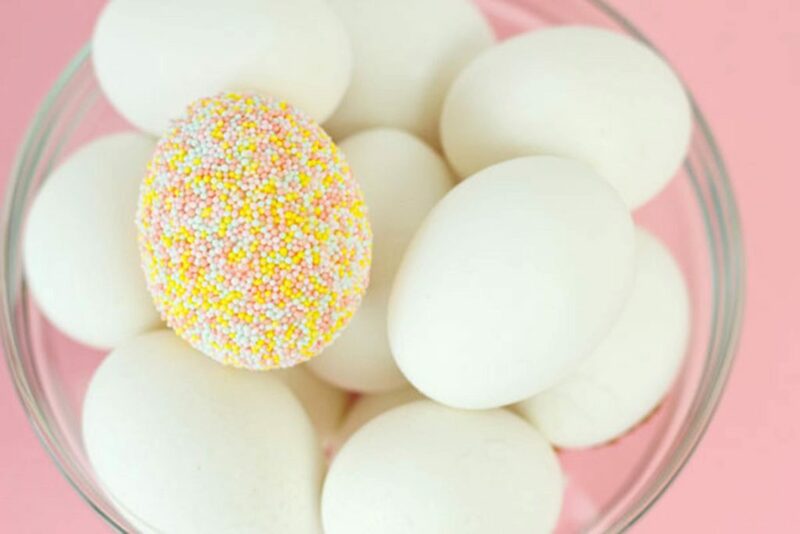 Paint your eggs with the tacky glue using the paintbrush and then cover them in sprinkles. Studio DIY! says to use a spoon to press the sprinkles onto the egg after you’ve covered it or else they won’t stick well. Tattoos – Most households with young children will have tattoos stashed in a drawer somewhere…why not use them to create these cool, no-dye eggs from the geniuses at Brit + Co. Simply apply fake tattoos to eggshells the way you would to your own skin. 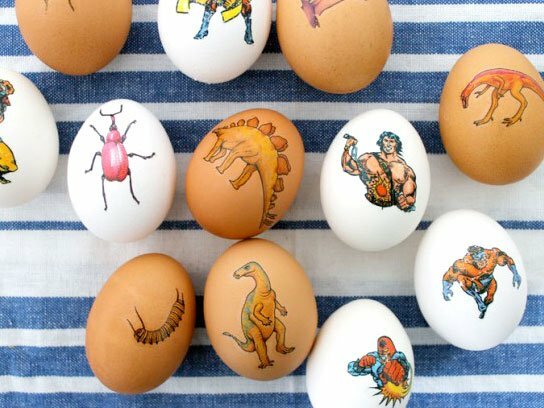 Instead of bright colors, you’ll get eggs stamped with spiders, superheroes, and more. Great designs and no mess to clean up! 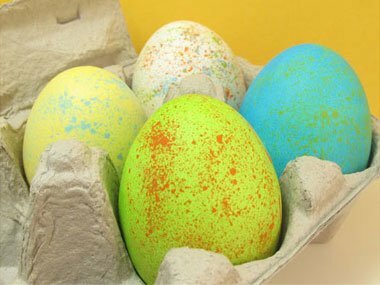 Speckles – Speckled eggs are meant to be imperfect, making them a perfect project for younger kids. To make your own, simply mix your food coloring and vinegar, and add your hard-boiled eggs as you normally would. 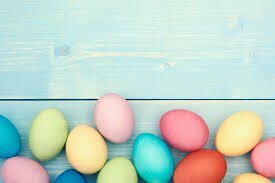 Once your eggs have attained the colours you want, simply flick on some craft paint using an old toothbrush…brown, black, white and blue will give you that traditional “speckled” look but any colour will work.